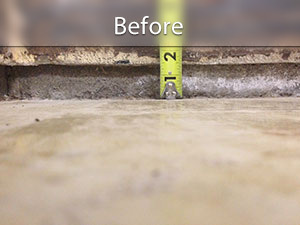 The PolyLevel® method preserves your finished floor, quickly! With PolyLevel®, homeowners can lift and level slab floors without disrupting their daily routine or damaging their existing finished flooring. 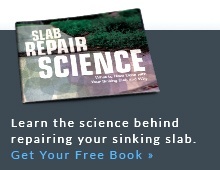 Slabs that were poured over fill or upon wet, weak, or poorly compacted soil are susceptible to settling and cracking. Large sections may sink below the level of the rest of the floor, or the entire slab may sink. As a result, flooring may pull away from the bottom plates of walls and baseboard molding and leave gaps of an inch or more. The top plates of walls may pull away from ceilings, ripping drywall and opening additional gaps at crown moldings. Tripping hazards are often created at cracks and exterior door thresholds. In addition to the appearance and safety issues, your home loses value in the eyes of prospective buyers when it comes time to sell. 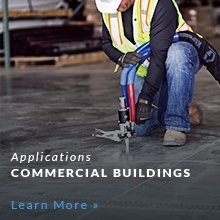 PolyLevel® technicians can resolve all of these problems with interior slab lifting services. Talk to your local contractor to find out if this is the right solution for your home - click below to schedule a free estimate! 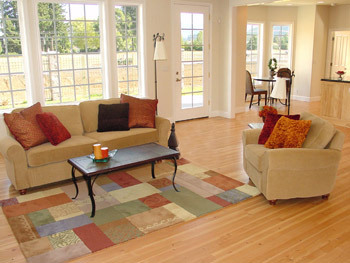 There are several traditional ways to raise the level of an interior slab floor. Each leaves something to be desired. One common approach involves spreading a self-leveling compound over the slab. It will raise the floor level, but will not stop the floor from continuing to sink in the future. Adding weight to the existing floor doesn’t help matters. Another method, called mudjacking, involves boring many holes in the affected slab and injecting a cement mix under the slab at high pressure. Once again, the slab floor will raise but the added weight of the “mud” will likely trigger further settlement. You may find yourself at square one in a couple of years. A third approach is to jack up the slab using multiple helical piers, slab brackets, and hydraulic jacks. Sizeable holes must be bored in the slab in order to accommodate the pier and bracket that bears against the underside of the slab. While this is a permanent solution, it is messy, disruptive, and expensive. If your slab floor is covered with a finished floor, such as carpeting, tile, or wood, none of the above methods will allow you to preserve it. Once your slab has been raised, a new floor would have to be laid. In addition, both methods are highly disruptive and messy. They involve hauling equipment and materials into your home. A much less disruptive method for concrete leveling utilizes high-density expanding polyurethane foam to do the heavy lifting. No heavy-duty equipment, no dust or debris, no crews trampling through your home. Typically, a single technician bores a few penny-size holes through the sunken slab in each of the affected rooms. He then pulls in a hose from a box truck parked in the driveway and injects a two-part polyurethane resin and catalyst solution. The solution spreads under the slab until it “flashes,” or begins to expand. A large pillow of foam gradually raises the slab to its original level position. Because the injection holes are few and small, your existing finished floor can often be preserved. In the case of carpeting, a small flap is made by cutting on three sides. When the job is completed, it is re-adhered to the slab. With a wood floor, the process is similar. A hole-saw is used to remove a small plug of flooring and is glued back in place upon completion of the job. With a tile floor, it often makes sense to remove a few tiles and to replace them with spares. 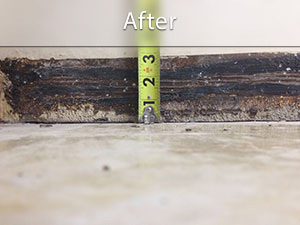 If your slab floor is no longer level and gaps have appeared along baseboards or at the ceiling, contact your local PolyLevel® contractor today for a Free Estimate. Most jobs can be completed in a day or less with little disruption and virtually no mess.